This dish is a one skillet dish…yes even the pasta! It is extremely flavorful, and we loved the bold lemony garlicky sauce. Everyone had seconds, even Ellie, who doesn’t eat much pasta. It’s so good, that it tasted restaurant quality…yes, it’s that good! Ethan proclaimed: “This is a keeper”. There you have it. We will most definitely be having this dish again and again. Since we love garlic, lemon, and Italian seasoning, I added way more than the original recipe. If you’re not into those bold flavors as much, reduce those amounts to your liking. Season chicken well with salt and pepper. Heat the oil in a large, 12-inch nonstick skillet over medium heat until the oil is hot and rippling. Add the chicken and saute, stirring frequently, until the chicken is browned and cooked through. Remove the chicken to a plate, keeping as much oil/liquid in the skillet as possible. Keep the skillet on medium heat and add another teaspoon of oil if needed (I usually don’t but you’ll want to keep an especially close eye on the garlic). Add the garlic and Italian seasoning and stir constantly for about 30 seconds. Add the water, broth, lemon juice and pasta. Stir to combine. Bring the mixture to a simmer and cook, stirring occasionally just to keep the pasta from sticking, for 10-12 minutes until the pasta is tender – it will cook for a few more minutes in the next step. (Depending on the type of pasta you use, your cooking time may differ, so keep an eye on the pasta so you don’t overcook it). There will be a bit of liquid left in the skillet; that’s ok.
Add the broccoli and lemon zest. 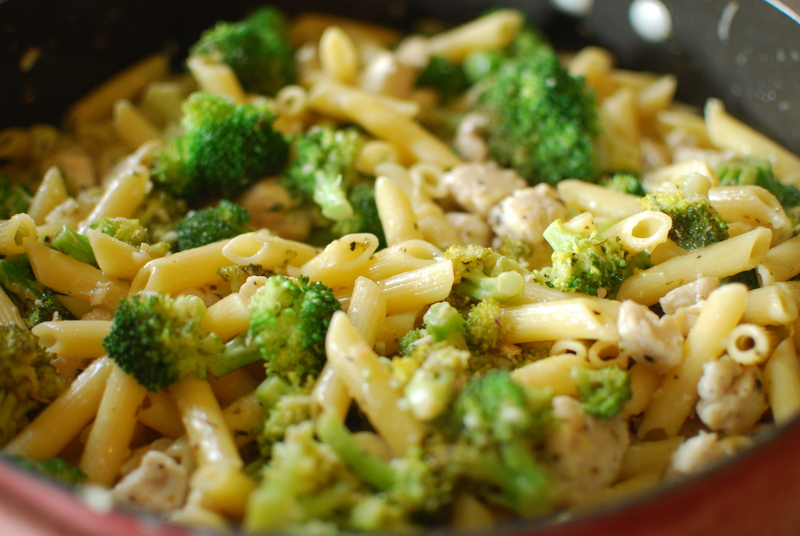 Cover and cook for 2-3 minutes until the broccoli is bright green and tender. While the broccoli is cooking, whisk together the milk and cornstarch. Uncover the skillet and stir in the milk mixture along with the Parmesan cheese and reserved chicken. Simmer, uncovered, until the sauce has thickened slightly, 1-2 minutes. Season with additional salt and pepper (this is really important – don’t skip this step!) and serve.